You know what it’s like, trying to get help from your local hospital for yourself, your kids or your elderly parents. It doesn’t have to be like this, and in fact, things are looking promising. With video conferencing re-purposed for healthcare many consultations can be handled online via your smartphone or computer, especially for people suffering chronic conditions where the underlying problem has already been diagnosed. Not only does this alleviate some of the frustrations of visiting a hospital for the patient, it also takes some of the strain off the thinly stretched resources of the clinics and hospitals. And it allows better use of resources overall, allowing medical professionals to see patients while dedicating the rest of their time to research. On top of this, it makes resources available regardless of geography balancing uneven demand and supply between regions at different times. 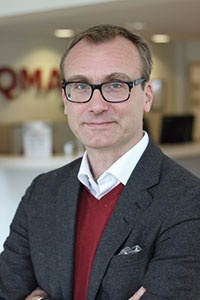 Setting up the structure to handle customer flow and customer journeys seamlessly between online and offline is an interesting technological and administrative challenge that Qmatic has been exploring for quite some time now. And we are happy to report; it is all looking good!